Boss Horseboxes is a family owned and run horsebox manufacturer based in Flint, just over the border into North Wales. 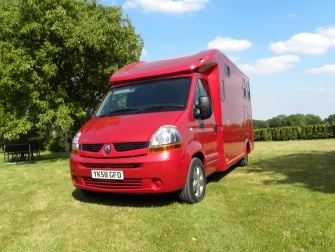 (3.5 tonne horsebox for two horses, carried rear facing). Paul Williams and Clive Ecroyd own and run BOSS. Paul’s wife Emma heads the admin team and Clive’s wife Penny heads the secretarial and accounting role. Paul has over 20 years experience in building horseboxes. Clive is an aerospace trained engineer and has run engineering based manufacturing businesses for 35+ years. He built his first horsebox 30 years ago and it is still in existence today! In 2009 Clive and Paul got together with a goal of designing a super lightweight highest quality 3.5 tonne horsebox that was superior in design, weight carrying capacity and features to anything on the market. One and a half years later the Boss 35 was born. This new concept has radical aerodynamic styling and great options. Launch was a great success and the order book filled with deliveries from new orders taking 6 weeks. The new Boss 35 two horse box is positioned to take maximum advantage of the 3.5 tonne laws which allow drivers from 17 years old to drive on a car licence under car rules. No special licence, MOT not plating, no tachograph, no drivers hours recording or speed limiters apply. We believe that as fuel becomes more expensive the switch from 7.5 tonne upward horseboxes will be to the 30+ mpg 2 horse 3.5 tonne horseboxes. When Boss researched the competitors, and there are many of them, the opportunity to make a high quality, beautiful, competitively priced 3.5 tonne horsebox was obvious. In many boxes, whilst being servicable, good looks were a rarity, and the design and layouts were open to improvement. We also found unsuitable materials were being used that were both heavy and subject to rot or rust. The Boss 35 is designed and built to be the Best 3.5 tonne horsebox on the market without compromise. Our customers agree with us.